HPE has a US$4b plan to build out a computing architecture that spans the data center, the edge network and the cloud over the next 4 years. HPE's pledge to pump billions of dollars into developing edge systems shines a light on the company's ambition to be the leading end-to-end computing infrastructure provider. CEO Antonio Neri made the investment announcement at the company's Discover conference Tuesday in Las Vegas, in his first appearance at the company's annual event as chief executive. He took over the CEO role from Meg Whitman in February. Neri said that HPE will use the funds to advance the development of "intelligent edge" products, services and engineering initiatives. Edge-network computing, he said, presents opportunities for enterprises as they decentralize their data capture and analytics capabilities to capitalize on the flood of information generated by IoT and mobility technology. “The edge is where most of your data is being created; we live in a time where data lives everywhere and so will your clouds,” said Neri. “We believe the enterprises of the future will be edge-centric, cloud-enabled and data driven — I believe this next revolution requires an edge-to-cloud architecture." 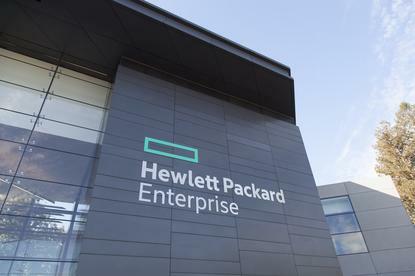 HPE will use the US$4 billion to advance the development of edge products, services and engineering initiatives throughout the organization, in areas including connectivity, security, automation and AI, Neri said. HPE's investment comes at a time when IT providers as well as enterprises see growth opportunity in edge technology. "The edge is the next big opportunity for all of use," Neri said. "We're going to see increasing growth at the edge," said Crawford Del Prete, executive vice president officer, at IDC, speaking in a live HPE broadcast from the Discover conference. "We can’t process data fast enough by moving it across the internet," he said, noting that that applies particularly to autonomous automotive systems that need to recognize objects in split seconds. In the first quarter of the year, HPE generated $3.3 billion in server sales, capturing 19.9 percent of the revenue generated in the market, coming in a close second to Dell EMC, which had $3.6 billion in sales and 21.5 percent revenue market share, according to IDC. HPE shipped 400,958 servers in the quarter to Dell EMC's 555,792, IDC said. HPE's ambitions to be an end-to-end computing-infrastructure provider can be seen its move to add Microsoft Azure and Amazon Web Services capabilities to its GreenLake pay-per-use offerings, providing a turnkey, managed service to deploy public and on-premises clouds. The announcement about the expansion of the GreenLake service was made a few hours before Neri took to the Discover stage. In his keynote, Neri said InfoSight will be brought across the company's complete product portfolio. HPE already has a lead in converged systems for the edge network. Last year at Discover it announced its EdgeLine Services Platform (ESP), a software foundation layer on which the company and its partners can build and plug in apps to manage data from a variety of different sources. The software runs on the company's converged EdgeLine devices. Edge computing, particularly in the Internet of Things, is used to help construct smart buildings and cities, more efficient factory floors and retail experiences, and it's a big opportunity for vendors like IBM, Cisco, GE and HPE. "There really isn’t an end-to-end IoT solution," said Peter Havart-Simkin, a research director at the IoT Group within Gartner's Technology and Service Provider research group. "There are no dominant players and as far as Gartner is concerned this is the top of the hype cycle," Havart-Simkin said, in an interview before Neri made the investment announcement. There are more than 1,800 companies that claim to be involved in IoT-related technology, Havart-Simkin said, and a shakeout is coming. HPE's investment puts it in a position to not only survive the shakeout, but snap up smaller companies with innovative edge-related technology.